This page provides basic information for retailers about Chicaoji and Waugh Enterprises LLC. Full case has 12 bottles. *Free delivery to wholesale customers for orders $60 and over to WA, OR, ID, and Northern CA. Please ask your distributor to carry Chicaoji. If your store is outside the free delivery zone, I will share the cost of shipping with you 50/50. 12 oz- $51 per ½ case. Speak clearly when you leave a message on the phone. Please say your phone number twice so I am sure to get it. Phones, particularly cell phones, sometimes garble messages. 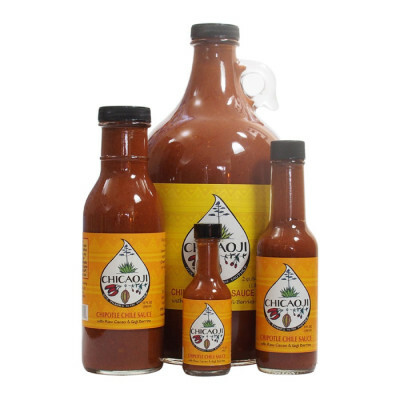 Chicaoji is a certified organic shelf stable medium-heat vegan sauce made with Kosher, gmo free, and gluten free ingredients. Chicaoji is raw except for the chipotles which are smoked at 165˚F and contains no artificial colors, flavors, or preservatives. That’s it: no other ingredients. Chicaoji’s ingredients are organic, vegan, gluten free, and raw (except the chipotles). Organic and kosher certification documents available by request. We are in the process of obtaining organic and kosher certifications for Chicaoji itself. Made in a certified organic facility on Lopez Island, WA. Each bottle is batch numbered to facilitate recall, if necessary. Waugh Enterprises LLC is licensed in the State of Washington with the product liability insurance required for retail sale nationwide. Over 130 stores and restaurants provide Chicaoji. I created Chicaoji guided by the idea that food is medicine. All the ingredients were selected with this concept in mind. Chicaoji’s very complex flavor combines with a great diversity of foods as a condiment and ingredient in recipes. My goal is to provide a healthy and nutritious food that adds delicious flavor to anything. The smoky chipotle heat accents rather than dominates. A wide range of customers like Chicaoji including some who typically “don’t like spicy foods”. Customers who know that food is medicine instantly recognize Chicaoji is nutritional and beneficial. I offer free bottles of Chicaoji to facilitate in-store sampling. Temporary price reductions for in-store specials, promotions, monthly flyers, and coupons, and etc. Beautiful wooden Point of Sale displays. The Chicaoji bottles: 1.7, 5 ,12 and 64 oz Growler. Thank you for considering Chicaoji Chipotle Chile Sauce for your customers. I am confident your customers will appreciate your bringing Chicaoji into your store.